7 Tips to Create Community & Connection on Pinterest. Have you ever wanted to go window shopping with all of your friends? Pinterest is the social image sharing site that simplifies organizing of images into “Boards” rather than Albums. It is easy to see amazing photos for everything you are passionate about as well as to make a Board to organize all of the visual ideas you have for that next remodeling project, clothes you want or the yoga poses you love. If you want to make sure your yoga studio or even just you as a teacher are using Pinterest effectively, take a break from window shopping and Liking images of tattoos and vacation destinations, let’s integrate Pinterest into your Social Media Strategy! 1) Create a few Boards that are representative of your interests and aspects of your business. As a yoga studio you may have Boards such as Retail, Poses, Teachers, Community, Videos, Blogs. Keep some of your Boards for Pinning stuff from other people and companies as well as Boards just for your own content. Depending on how much content you create decides whether you integrate your boards or keep them separate. 2) Upload the best images you have on a regular schedule. Jump start your Boards by loading content you already have put up on Facebook, etc. It is critical to commit to loading content regularly—this will keep your content and brand in front of the people who Follow your account and Boards. 3) For each image you upload or Pin, use the Caption space effectively. This requires essential languaging as the space shown with the picture is not significant. If you are Pinning a Picture quote consider including the quote as text in the image. 4) Edit the image once you have uploaded or Pinned it. This gives you the ability to fix or add a caption and more importantly to add an active link. This way if people are in the full size version of your image and click on it again they will be taken to the active link. This is powerful when sharing your videos and blog posts. Looking forward from an SEO perspective, as Pinterest is indexed by search engines this will improve your search ranking. 5) Follow the people in your Community, your Teachers, and Products you Love. This is the best way to get a feel for what is happening in your local community and participate by Liking and Commenting. 6) Pin from other people. This is the easiest way to create Social Capital. As a Leader in your Community you must show people the way. Make it easy for people to give to you by giving to them first! 7) Tell everyone you are on Pinterest. Sounds obvious right? Put your Pinterest address on your website, in your email signature as a link on your Facebook Page, Tweet out some of your images and maybe even write a blog post about what you are sharing on Pinterest. This is not only for you bendy yogis out there—it is also immediately relevant to how we approach all social media strategy. As you Pin images you are sharing your asthetic, personality, philosophy and community. Remember this is a public community and what you Share or Like may be public forever. Your energy is contagious, when you enjoy yourself you attract people into your community and you will spread yoga and your message even further. Check out elephant journal on Pinterest! Like elephant work & money on Facebook. Great Post Jamie. I agree with all your points about creating connection on Pintrest, especially the fact that your image should be real and impressive to lay the right foundation. Jamie Ginsberg is a yoga teacher and the co-founder of Marin Power Yoga. He is a technology and education evangelist focused on using the social web to increase interaction and engagement. 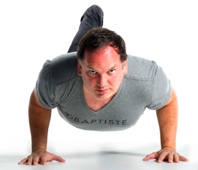 Jamie is a yogi (200 hour teacher training at Cleveland Yoga and Level 1 & Level 2 with Baron Baptiste) and has shot and produced videos and photography for Baron Baptiste, Yoga Journal Conferences and yoga studios across the United States. Jamie’s expertise is a rare blend of creative, business, legal and technology. Jamie has a Bachelor of Arts in Communications from the The University of Michigan and a Juris Doctorate from The Cleveland-Marshall School of Law. Link to Jamie here and like him on Facebook.